ADMINISTRATIVE ANNOUNCEMENTS: Two principals, Michael Cristofaro (Westmount High School) and Jacques Monfette (Wagar Adult Education Centre in Côte Saint-Luc), have announced they will retire as of July 1, 2018. Their successors will be Robert DiMarco (presently at Westmount Park Elementary School) and Nicholas Katalifos (presently at Roslyn Elementary School in Westmount) respectively. Here are mre principal appointments for the 2018-19 academic year: Marylene Perron, Westmount Park (presently interim VP at John F. Kennedy Adult Centre in St. Michel); Joanna Genovezos, Roslyn Elementary School (presently principal at Coronation School in Côte des Neiges); Mike Talevi, Coronation (presently the principal at Dante Elementary School in St. Léonard); Irini Margetis, Dante (on leave this year as principal of St. Monica Elementary School in NDG); George Koutsoulis, Parkdale Elementary School in St. Laurent (presently interim principal); Silvana Crigna, St. Monica (presently principal of Sinclair Laird Elementary School in Park Extension); Derrek Cauchi, Sinclair Laird (presently principal of James Lyng High School in St. Henri); Lino Buttino, James Lyng (presently the interim principal of the Alternative/Outreach School Network); Rick David, High School of Montreal in the Plateau (presently interim assistant director of AEVS); Darlene Kehyayan, James Lyng Adult Centre (presently interim in that post); and Anna Maria Borsellino, Laurier Macdonald Career Centre (presently Assistant Director of School Organization). New vice-principal appointments are: Réal Heppelle, FACE (presently vice-principal of East Hill Elementary School in RDP); Jessica Monti, East Hill (presently a teacher at Rosemount High School); Eugenia Carystios, Gardenview (Presently vp at Royal Vale Elementary School in NDG); Maya Doughan, Honoré Mercier Elementary School in St. Leonard (was teacher at Marymount Academy International, currently interim vp at Honoré Mercier Elementary School); Assunta Caruso, Lester B. Pearson High School in Montreal North (presently vp at Leonardo Da Vinci Academy in RDP); Cynthia Canale, Laurier Macdonald High School in St. Leonard (presently a teacher at the school); Tanya Alvares, Marymount Academy International in NDG (presently interim vp at St. Pius X Career Centre); Christy Tannous, Royal West Academy in Montreal West (presently vp at Pierre de Coubertin Elementary School in St. Leonard); Vince Timpano, Vincent Massey Collegiate (presently vp at FACE downtown); Matthew Shapiro,Westmount High, presently a teacher at Focus School; Saverio Servello, Royal Vale (presently vp at Rosemount Technology Centre); Ivan Spilak, Leonardo Da Vinci Academy (presently a teacher at Vincent Massey Collegiate); Gregory Watson, Michelangelo International (presently interim vp at Mackay Centre/Philip E. Layton); Ruben Azevdo, Pierre de Coubertin (presently interim vp at Marymount Academy International); Denise Maroun, Mackay Centre/Philip E. Layton (presently interim principal at St. Monica); and Véronique Carriére, John Paul I Junior High School (presently interim vp); and Alain Belair, Rosemount Technology Centre (on sabbatical this year). DELAY OF ELECTIONS: The EMSB Council of Commissioners has adopted a resolution by majority, calling upon the Minister of Education not to postpone school board elections scheduled for this November. GRADUATION RATES: The EMSB television commercial promoting our high graduation rate was profiled on a CTV report on the subject. General Vanier Elementary School Principal Joe Schembri was interviewed. You can see it here. 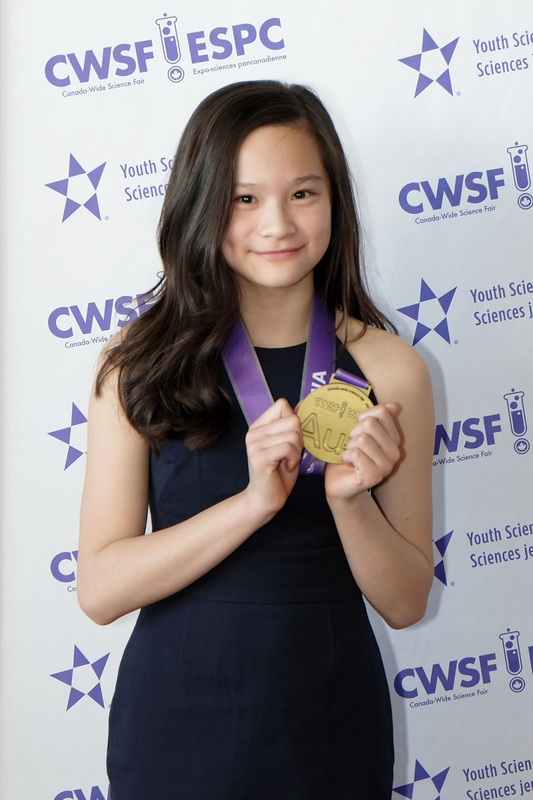 A LIFE CHANGING EXPERIENCE: Allison Engo, 13, a Secondary III student at Royal West Academy in Montreal West, just returned from the Canada-Wide Science Fair in Ottawa with a gold medal. She also received a $4,000 Entrance Scholarship from Western University. Her project was entitled How Fly Are Antioxidants? She describes it on this video with our junior reporters Gaby and Lulu at the 2:21 mark. In her research she tried to determine whether antioxidants had any benefits for fruit flies or whether it applies to humans. "It was an experience I will remember for the rest of my life," she says. "We got the VIP treatment - tours of Ottawa, tours of university labs, took part in experiments, visited museums, saw a magic show, and ended with an elegant gala. The best part of it was that I got to make new friends with the 500 science students from all over Canada. We all had an amazing experience and we all learned so much from each other. I have never seen so many cool inventions and innovative projects under the same roof. I also never dreamed I would end up being interviewed live on CBC radio." MERIT AWARDS: Congratulations to Anneliese Thelema Eckhardt-Moxie of Rosemount High School, Christopher Philbrick of Laurenhill Academy and Tina Zhang of Royal West Academy, winners of the 2018 Merit Award offered by the Women's Canadian Club of Montreal (WCCM). The award is given to deserving students ages 14 to 17 who excel academically and socially, and/or exhibit outstanding school and community involvement, and/or show leadership ability. Congratulations also to Addison Yasvinski of Rosemount High School, a winner of the 2018 Merit this site for more information on this exciting once-in-a-lifetime experience. EDUCATIONAL BURSARY: Westmount High School student Paul Terrado has been presented with a $200 educational bursary for participating in the final contest of the Rotary Club of Montreal’s Public Speaking Contest held at the St. James Club on May 11. Once he decides upon the educational institution he will be attending, the Rotary Club will forward a cheque there directly. Michael Cristofaro congratulates Sabrina Jafralie. community service, organizing many initiatives at Westmount High School and around Montreal. One such initiatives was a school-wide campaign called “Soles to Soul” where she led the collection of gently worn shoes that were distributed all over the world. 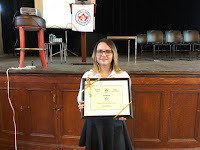 A strong believer and advocate for holistic education, Sabrina also received the 2014 Community Leadership Award from the Montreal Community Cares Foundation, after being nominated by her students. In addition to teaching, she is currently in the process of starting a NGO that promotes religious literacy across Canada. Sabrina obtained a Masters of Theological Studies from Concordia University in 2010 and earned a doctorate from McGill University in 2017. Diane Longo, Iris Hamilton and Roxanne Berube are thanked by senior management. DENIM DAY: The EMSB Administration Building marked National Denim Day for Breast Cancer Research on May 15, raising $410. Schools and centres participated as well. On this day, staff gathered in the cafeteria to wish three retiring employees well: Diane Longo, Human Resources; Iris Hamilton, Book Processing; and Roxanne Berube, French consultant. 13 REASONS WHY: The EMSB Student Services Department is providing some guidance to school principals about the release of the second season of the Netflix series 13 Reasons Why. EMSB Director of Student Services Lew Lewis explains that the original season raised attention internationally and gained popularity among students. The show told the story of a high school girl who commits suicide and leaves behind audio tapes that recount how 13 people she feels are responsible for her action. The series is based on a book and the series displays the sequence of events including the actual suicide in a very graphic manner. In Season 2, Netflix has now put into place warnings and resources (American) before and after the show. However, concerns that may impact children and youth, particularly those at risk, may surface. “Many children and youth have watched the series without their parent’s knowledge and many more are likely to watch it,” said Mr. Lewis. “They may also be binge-watching Season 1, which does not have those resources in place and thus remains a significant concern.” With this in mind, Student Services has provided documentation from the NASAP, including a reference to an on-line toolkit which contains very pertinent information for parents, educators and clinicians. There is also a list of Tips and Facts on suicide which the EMSB has issued annually as part of Suicide Awareness Week "Staff should not create teaching or group activities around this show,” Mr. Lewis warns. “However, should students speak openly about the show, guide the conversation towards critical thinking and reinforce the message that, when students experience distress, they can seek out help from adults.” Psychologist Despina Vassiliou, the coordinator of the EMSB Mental Health Resource Centre, is making herself available for schools. Here is the trailer. REMEMBERING ERIC CROTTY: The EMSB wishes to extend its deepest sympathies to the family of Eric Crotty, a former student at Willingdon Elementary School, who passed away recently. His mother Katherine Wilton is a reporter at The Montreal Gazette who often covers the education beat. Here is part of the obituary written by his parents: On a rainy Sunday afternoon last weekend, our beautiful son, Eric, left his home in N.D.G. to clear his head but tragically never returned. He took his own life after suffering from social anxiety for three years. He was 17 years old. Eric was surrounded by a family who adored him and teachers and classmates who enjoyed his good nature, humour and lovely smile. Despite this, his mental illness left him feeling lonely and isolated from his peers. He grew up in a wonderful N.D.G. community of great family, friends and neighbours. He attended Willingdon School, where he loved and excelled at math and geography, and shared Sheldon Cooper's obsession with flags. During his high school years at Collège de Montréal, Eric developed a passion for running, excelled at orienteering and became an accomplished math tutor. In Secondary IV, he developed an acute case of social anxiety that inhibited his ability to socialize. He doggedly fought his illness and accepted all forms of help and treatment available to him. With the support of his teachers and classmates, he graduated last spring and moved on to Marianopolis College to begin what he hoped would be a happier chapter in his life. 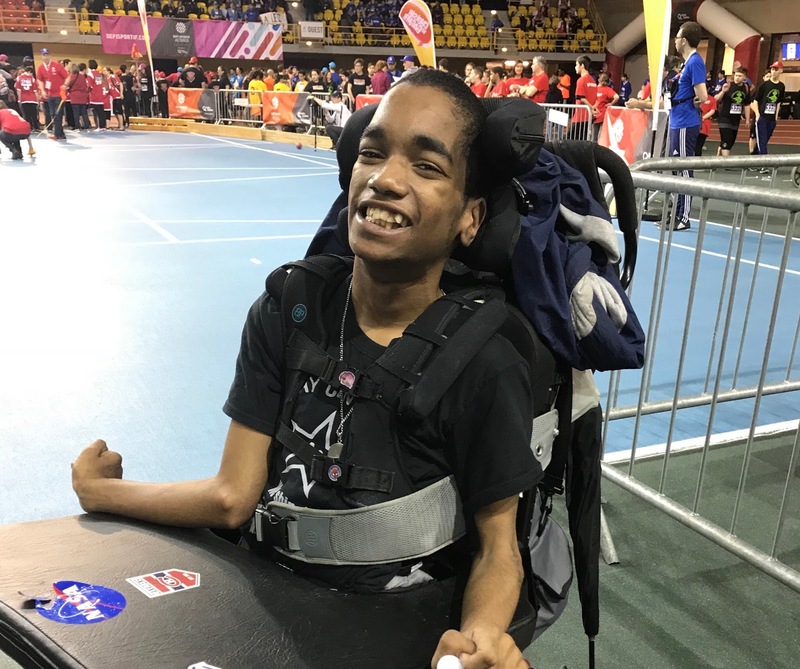 He joined the Reach for the Top trivia team and helped his team earn a spot in the Canadian championships later this month. He returned home enthused about all he had learned in his science and music classes and mused about studying chemistry in university. He was a member of the Montreal Ramblers orienteering club and played the Irish sport of hurling for the Montreal Shamrocks. He was making plans for the future and was excited to vote for the first time in this fall's provincial election. On most days, Eric was a happy young man with a ready smile and a great sense of humour. He was making progress tackling his social anxiety, but the loneliness and isolation he periodically felt became too much for him. This wonderful, sweet young man will be desperately missed by his parents, Niall Crotty and Katherine Wilton, and his sister Sarah. WRITE FOR JUSTICE CONTEST: Two groups of fifth graders from Willingdon Elementary School in NDG participated in this year's 31st edition of the “Write for Justice “contest, organized by the Bar of Montreal. Benjamin Onichino was a winner of this extremely challenging writing contest! He received a certificate, a software program, $200 and visited the Courthouse along with a few of his family members. Bravo to Principal Carmen Nicolas, Vice-Principal Steve Spetsieris and teacher Christina Prentas (teacher) for encouraging students to enjoy their passion for writing beyond the classroom. MENTAL HEALTH AWARENESS WEEK: The Mental Health Resource Centre (MHRC) encouraged students and staff of the EMSB to reflect on self-acceptance for this year’s theme. The MHRC released a newsletter, invited Sandra Reich to give a workshop and students from elementary to high school reflected on what is self-acceptance and what practices they use to embody it. 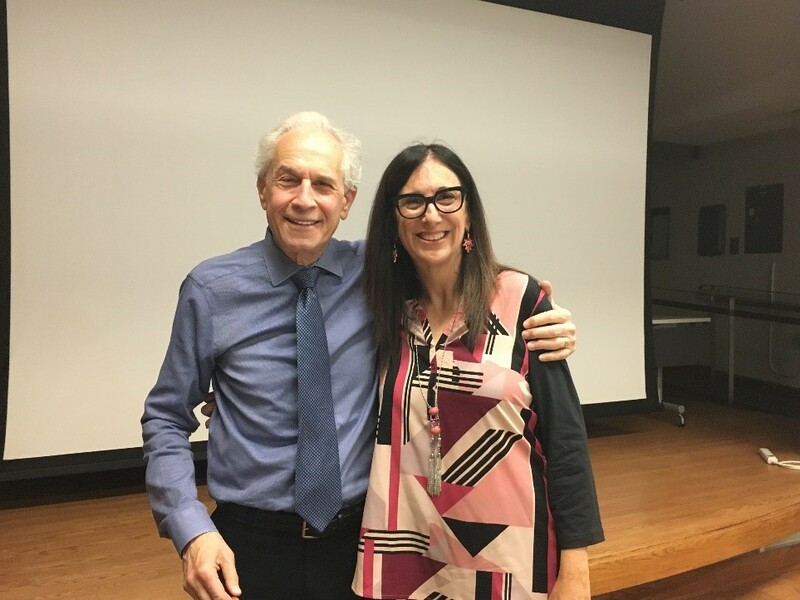 Ms. Reich, the Clinical Director of The Montreal Center of Anxiety & Depression, came to the EMSB head office and encouraged attendees to reflect on their personal trajectories, how they see their role in what happens around them and challenged them to accept themselves and empower themselves with the choices they make in their lives. In the schools, the students came together to reflect on their own self-acceptance practices and produced their Humans of the EMSB videos. Winning videos were from John Caboto Academy, Focus High School, Lester B Pearson High School, and Royal West Academy. 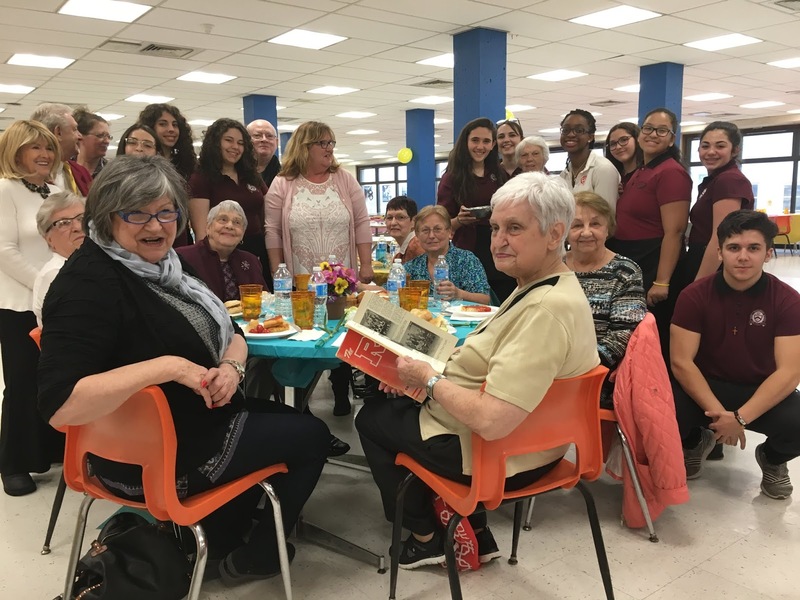 Lester B Pearson High School also created daily activities during Mental Health Awareness Week such as in-class and special workshops on self-acceptance for students, self-esteem building activities, and art activities that all fostered self-acceptance. A special thank-you to all of the guidance counsellors, spiritual and community animators, teachers, principals, and students who participated. The more we talk openly about mental illness, the more we reduce the stigma and we empower each other to adopt mentally healthy attitudes. Please visit http://www.emsb.qc.ca/mhrc/mhaw.html to see some of the amazing videos produced. HUMANITARIAN/ENVIRONMENTAL AWARD: The Willingdon Home & School Association is incredibly proud to share the news that the school was presented with the Pat Lewis Humanitarian/Environmental Award (QFHSA). This honours elementary or high school students for their outstanding efforts towards a humanitarian or environmental cause. It went to the entire Willingdon student body, the Willingdon staff and the Willingdon H&S parents in recognition of their collective efforts in promoting awareness around water issues through our school's water challenge and the WE Walk for Water; supporting the recycling program and raising awareness around composting and waste reduction at H&S events; supporting for the NDG foodbank through our holiday food drives and the new Thoughtful Thursday initiative; supporting our foster child in Equador; and bringing Unité Sans Violence into the school. LDVA NEURO: The Leonardo Da Vinci Academy Neuro Running Team, made up of students, teachers, administrators and parents, accomplished the challenge of running a 5K run at Defi Caritatif Scotia Run 2018. They raised $5,803$ for the Montreal Neurological Institute. Danica Lewington, Nadia Sammarco, Joseph Monachino, Angela Mancini, Julie René de Cotret, Patricia Sansone, Sandrine Aschour and Victoria Della Cioppa. The teachers are congratulated by staff and students. TEACHER RECOGNITION DAY: Three teachers from the EMSB were recognized with special awards from P.F. Chang’s and La Cage Brasserie Sportive on the occasion of National Teachers Day. The ceremony took place at John Caboto Academy in Ahuntsic and was co-sponsored by City’s Breakfast Television. The EMSB received many nominations for the awards, which fall into three categories: youth sector, adult sector and physical education and health. Jose Lourenco, hospitality manager for PF Chang’s Montreal, presented $100 gift cards to teachers Shaun Simon from John Caboto, Lucille Ducol from General Vanier in St. Leonard and Jelena Molter from Pius Business Centre in Ahuntsic. Breakfast TV personalities Catherine Verdon Diamond and Elias Makos were the emcees. Here is the Breakfast TV coverage. ANTI-BULLYING INITIATIVE: An anti-bullying initiative undertaken by St. Gabriel Elementary School in Pointe St. Charles is to provide students, teachers and staff the opportunity to discuss the impact of bullying behaviour, actions that can be taken to deal with and prevent issues of bullying, and how a positive and safe school culture can be created. Students have been participating in various activities such as a school-wide quilt project where they are creating slogans about anti-bullying and kindness, engaging in classroom discussions, and participating in an art project (weaving positive words into school fence). To mark the last day of the initiative, on May 16, students and staff were wearing pink and took a pledge to show that they were taking a united stand against bullying. VIDEO CELEBRATES MACKAY STUDENT: Shyheim Eloï Ramdhaney will be graduating from Mackay Centre School in NDG this year after 17 years as a student. To celebrate his graduation, he wanted to make a movie to inspire everyone around him. Teacher Dana Strohl, her senior class and computer teacher Gaye McConnell, were happy to fulfill this 21-year-old’s request. 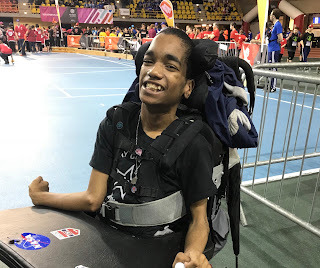 The video shares Shy’s positive attitude about life in the face of his physical disability, and how he never gives up, he just “keeps going and going and going.” The video shares the profound influence that his smile and his sense of humour have had on the Mackay staff and his fellow students. As you watch it, you will smile too, and learn how his upbeat approach to life has changed his friends and teachers. Treat yourself and watch the video here. Mackay and Philip E. Layton students accept their medals. Seniors and students work together. Rocco Speranza cleans up with students. 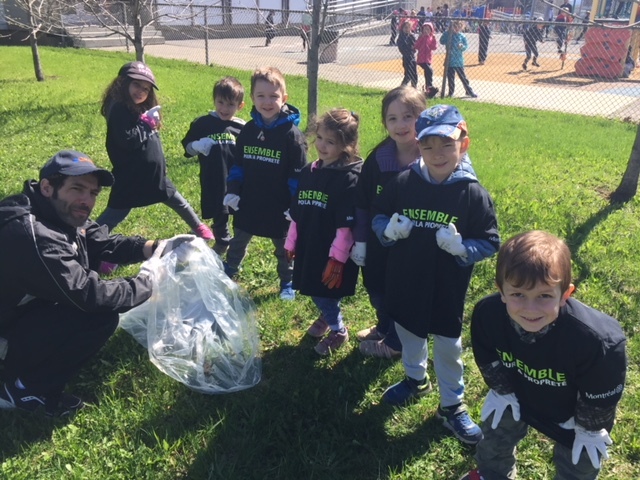 EDWARD MURPHY CLEAN UP: As part of its Green Project, students and staff at Edward Murphy Elementary School in Hochelaga-Maisonneuve gathered together to clean up the grounds and surrounding green spaces. 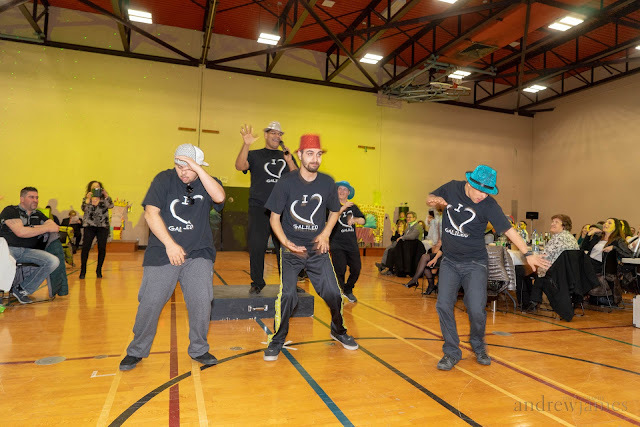 The day was part of the Montreal Ensemble pour la Proprete Program, as well as a part of the Greater Montreal Day where every act of kindness counts. Students and staff spent the morning, with their Spiritual and Community Animator, Rocco Speranza, learning about the 4Rs. Reduce, Reuse, Recycle and Respect. They learned that it is essential to have respect for the planet, the environment, classrooms, communities, and the animals. FUN 15 WITH FRIENDS EQUALS #NEWFRIENDSHIPS: In April, Edward Murphy autism class teachers Alana Goodings and Cynthia Fugnitto initiated Fun 15 with Friends, a reverse integration program where mainstream students and staff spend time with students with autism to increase awareness and social interaction. Over 80 students and staff volunteers spent their morning recess, on a rotating basis, interacting with students in their two autism classrooms. Goodings and Fugnitto held a sensitization session prior to starting Fun 15 with Friends, where Issues like how to be a friend and sensitivities that a person with autism may have were discussed. 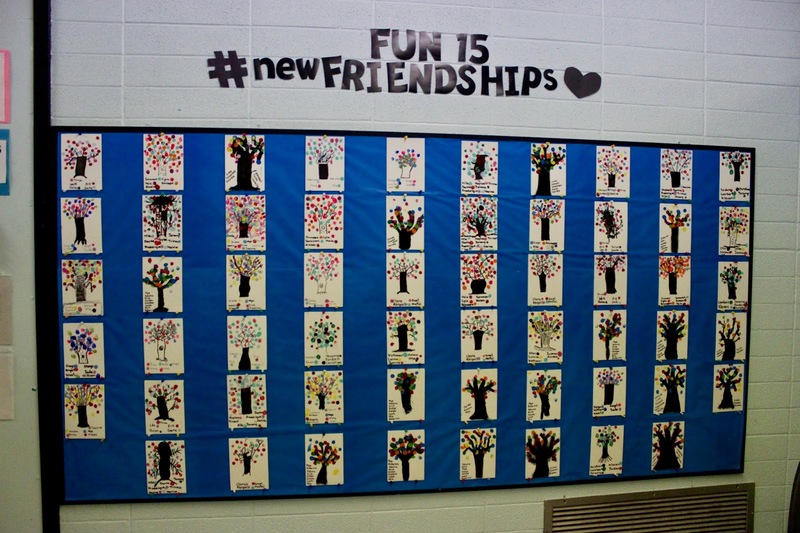 Each of the 17 “friend groups” created an artistic tree that was displayed on a wall board outside of one of the autism classrooms, symbolizing new friendships. Goodings and Fugnitto would like to see this type of initiative continue, and hope to do so next year. Alana Goodings, Daniella Alessi, William Campbell, Jacob Caligiuri, and Cynthia Fugnitto in front of the logo contest board at Edward Murphy Elementary School. AUTISM AWARENESS LOGO CONTEST: Fifty-eight Edward Murphy students participated in a logo contest to promote autism awareness. The goal was to have students think about autism and what it means to them, and put it in their own words and drawings. 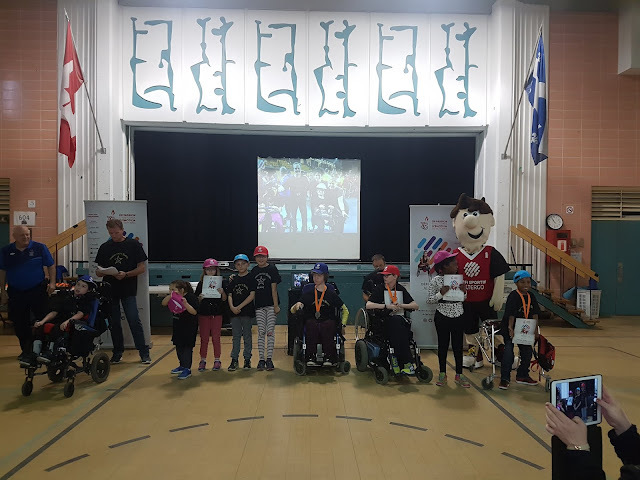 The logos were displayed on a wall board, and reviewed on May 10 by the judges: Autism Speaks Canada – Montreal Walk's Krista Leitham, Inspirations Newspaper Managing Editor and Coordinator of Operation Wendy Singer and school secretary Dolores De Michele. The judges were impressed and touched by the sensitivity and beauty of each logo. The winning logo depicting a super-hero style “A” was created by Grade 5 student William Campbell. It was chosen for its message of strength and encouragement, and its replicability. Campbell’s prize was a pizza party for his whole class! Second prize went to Grade 2 student Daniella Alessi for the sincere message of help and friendship that her logo portrayed. The third winner was Jacob Caligiuri, Grade 1, whose logo shared love and friendship, synonymous with Fun 15 with Friends. It also had no words, representing the many people with autism that are non-verbal. AUTISM AWARENESS LIBRARY: Edward Murphy has also embarked on a fundraising campaign to create a book and resource collection of autism-related material in their library. These English and French-language publications are for kids with autism, their siblings, and teachers. Edward Murphy teachers have also began sharing lesson plans. They welcome your support by either donating at Go Fund Me – Autism Awareness Library Initiative 2018 or purchase a book on their wish list at Amazon.ca – Autism Awareness Library Wish List or Chapters Indigo Wish list – Wish List: Alana Goodings. 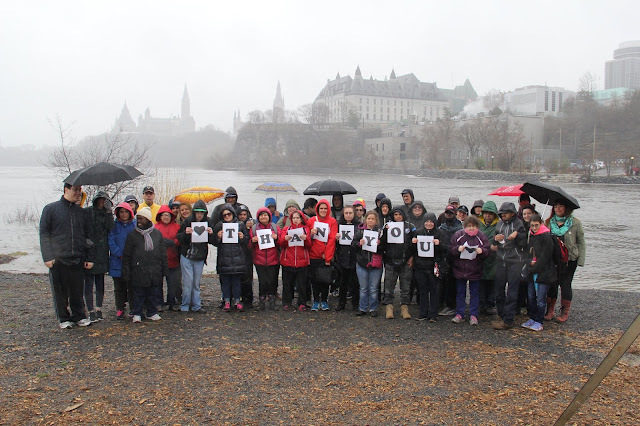 AUTISM SPEAKS CANADA – MONTREAL WALK ON MAY 27, 2018: Join Team Inspirations EMSB to walk and raise funds and awareness for autism, and have a fun Sunday morning! This year, Team Inspirations, EMSB is co-chaired by Alana Goodings and Cynthia Fugnitto, teachers at Edward Murphy Elementary School. To register, visit www.ascwalk.ca, and search for Team Inspirations EMSB. Walk dollars raised support access to resources, inclusive programming, services for young adults, community grants, and world-leading research. For information, contact Alana at agoodings@emsb.qc.ca or kristaleitham@autismspeakscan.ca. EMSB IMPACT GAME: The annual EMSB Impact Soccer Night will take place on Wednesday, June 13 at Saputo Stadium when Montreal hosts the Orlando City SC. More than 2,000 tickets have been sold. ALOUETTES OFFER GREAT OPPORTUNITY: The EMSB will have a presence at the Friday, June 22 home opener for the Montreal Alouettes at McGill Stadium when they host the Winnipeg Blue Bombers. Schools and centres have the opportunity to make available a block of tickets for the very special price of $15 each Two dollars from each ticket sold will go back to the seller. A number of schools have already agreed to participate. It is simple as all oft the tickets will be purchased online via a special code. NUTRITOWERS: The next big project for Gerald McShane Elementary School in Montreal North is adopting 4 Nutritowers for classroom learning on the importance of growing vegetables and in turn, preparing healthy salads at lunchtime. With the Nutritowers, students are provided a two-hour workshop on how to use the tower, growing plants from Seed to Harvest, maintaining the plants as they grow, and the science behind hydroponic growth. Grades Pre-K to Grade 6 have chosen to have the Nutritower in their classrooms. Not only will they be growing kale, tomatoes, cucumbers, herbs and lettuce, but they will master the art of making sure they can render enough produce to sustain a salad bar that will eventually be put in place at lunchtime. The Nutritowers are on moveable trolleys so that they can be transported easily during the summer months so that the community volunteers can take care of them. Organizers are very excited for this project because it touches many needs of our community and is a great classroom activity as well. The older grades will come up with a schedule of their own on who does what, the younger grades will have a much simpler approach to the project. It’s a wonderful project with kids of many ages and it can be approached in many different ways. The Nutritowers will be available in 30 different EMSB schools starting in September 2018 and many students will benefit from the "Seed to Harvest" program offered by Nutritower, a Montreal based company. For more information, they can be reached at info@nutritower.com. See the video. MISSING CHILDREN: On Friday, May 25 (National Missing Children’s Day), Enfant Retour will be hosting a press conference at Pierre-Elliott-Trudeau Elementary School in Rosemount to launch SIGN4L, an innovative APP that will provide parents with an easy way to electronically store up-to-date images and physical descriptions of their child, such as height, weight, birthmarks, that could help responders in the event of an emergency. SIGN4L was made possible thanks to a very generous grant received from Telus Community Board. “Our goal is to inform parents all across Quebec about the importance of always having in their possession an up-to-date profile for each of their children,” said Director General Pina Arcamoni. “Of course, we would never wish for any parent to find themselves in an emergency situation, but should they ever be separated from their child in a crowded mall, public area or that their child goes missing, an up-to-date record can make a real difference in finding a missing child rapidly or a prolonged search.” The Montreal Police and the office of Borough Mayor François William Croteau will be represented. Royal Vale students take part in the Arcade. CODING QUEST ARCADE: Elementary students from 15 different schools gathered at Nesbitt Elementary School in Rosemount recently for the Coding Quest Arcade to showcase video games they made themselves. Coding Quest is an initiative the Learning Partnership, a national charity dedicated to promoting, supporting and advancing publicly funded education in Canada, had launched last year with the aim to bring the coding language into classrooms. The STEAM (Science, Technology, Engineering, Mathematics) focused program was designed to be easy to integrate into existing school curriculums to save teachers any unnecessary hassle. Last October, teachers and principals were given training on coding, which they brought back to their students. Students then spent months learning to code using Scratch, a free programming language and online community, and creating their video games, which they showcased at the Coding Quest Arcade. Although a total of 24 schools participated in the training, only 15 of them were able to be at the Coding Quest arcade because of space limitations. Some schools did, however, hold their own arcades. See our full press release. Participants show their enthusiam at the Fair. HYDRO-QUEBEC SCIENCE FAIR AND DEFI APPRENTI GENIE: The Elementary Montréal Regional Hydro-Québec Science fair along with the Defi Apprenti Genie took place May 4 and 5 at Westmount Park Elementary School. Both events took place at the same time, bringing together over 200 elementary students to showcase their science and tech projects. The topics for the science projects were many, ranging from energy to black holes. The fair was crowded, with 84 contestants and parents who came in support of the children. The judging for the Defi Apprenti Genie projects was on Friday. “There are judges who are in their science field that go and see them to evaluate their projects and to give them feedback on how to get further with their projects,” said Charlotte Dion-Gagnon from the Technoscience network, who assisted at the event to ensure everything went smoothly. Congratulations to all the participants, and in particular Sienna Malky and Alissia Cantatore (Gold, junior first cycle), Graziella Corsi-House (Silver, junior first cycle), and Cali Furtado Chouli (Gold, junior second cycle), all from Pierre de Coubertin School, and Zoe Garellek (Silver, Junior third cycle) from Royal Vale School. FOUR SEASONS PROJECT UNVEILED: The Four Seasons Project, a collection of mosaic panels created by students at FACE School, was unveiled on May 18 at the fountain in Carré St. Louis (corner St. Denis and Square Saint Louis) in the Plateau. Over the past three months, FACE artist in residence Konstantin Velitchkov and the students have been worked to create the four mosaics that will be on display throughout the summer. Initially, 60 designs were submitted for consideration. On hand for the opening will be 65 members of the FACE senior string orchestra playing excerpts of Vivaldi`s Four Seasons. Additionally, Grade 3 students wrote a poem based on the theme of the Four Seasons. Kerry Roebuck steps in as guest conductor. FACE STRINGS: On May 11, FACE School's String Department presented its final concert for the 2017-2018 year. 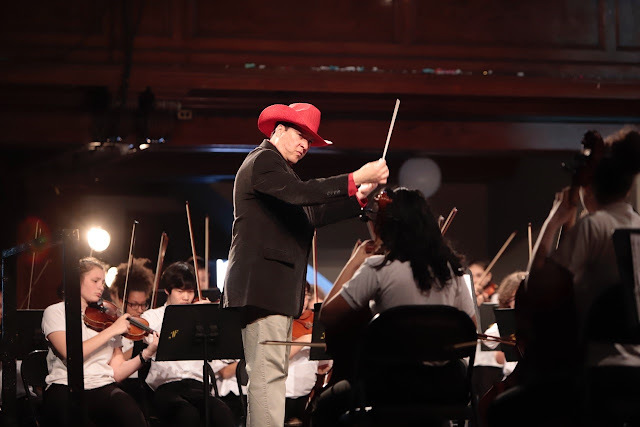 More than 250 string students, members of four different orchestras namely Junior, Intermediate, Senior and Symphony, played to a full house, under the direction of Kerry Roebuck, Guylaine Lemay, Catherine Le Saunier and Theodora Stathopoulos respectively. The students played many beautiful songs including Vivaldi’s 4 Seasons in front of a packed house. This concert marks the end of the school's renowned symphony orchestra's (the OSF) 20th anniversary celebrations. BAKED GOODS: On Global Greater Montreal Day, students from FACE Elementary School decided to participate by surprising staff around the school with homemade baked goods and free hugs! During recess they took to the sidewalk in front of the building to give out free coffee to passersby, waving balloons and spreading cheer. The students brainstormed their acts of kindness under the guidance of Elizabeth Pellicone (Spiritual Care Community Animator) and their teacher Mark Sankoff. WORLD CUP: On the opening day of the 2018 World Cup, Thursday, June 14 (9:30 am), St. Dorothy Elementary School in St. Michel will be hosting a World Cup Day, which will feature a soccer tournament and a food fair. All of the St. Dorothy students will participate in the soccer tournament and will represent countries that qualified for the 2018 World Cup. The Grade 5 students will also be preparing traditional dishes from some of the World Cup qualifying nations. Students will get a kick out of the exciting, educational events planned for the world’s largest soccer tournament. DAYCARE WEEK: EMSB B.A.S.E. (Before and After School Enriched) Daycare students celebrated Daycare Week from May 14 to 18 with cooking and gardening events across 13 daycares. Fueling passion for the environment, food and sustainable food practices in elementary school students is an everyday occurrence in the B.A.S.E. Daycare programming. B.A.S.E. Daycares hosted Food Revolution Day, inspiring celebrations for the third year in a row at three schools (General Vanier, John Caboto Academy and Our Lady of Pompei) as well as a “Garden Blitz” of activities, from seedling sales to planting days, at 10 others. These celebrations highlighted a year of environmental learning as well as the theme of this year’s Daycare Week from the Association Québécoise de la garde scolaire (AQGS): “LET’S RECOGNIZE THE IMPORTANCE OF THE COMPLEMENTARY ROLE OF SCHOOL DAYCARES IN THE SCHOOL TEAM!” The Food Revolution events consisted of Cooking Club students running various activities for their fellow daycare students. There were stations for the courageous—a “Blind Taste Test” and a “Whipping Cream Race and Dunk Tank Challenge” —and more culinary and art inspired stations where students can create edible art or build their own meals. See this press release. VERNISSAGE: On the occasion of the EMSB’s 20th Anniversary, the Department of Educational and Technology Services is proud to announce that on June 4 (11 am to 8 pm) they will be hosting a vernissage of numerous pieces of artwork created by our students. The vernissage will take place in the Atrium of the Administrative Building and will feature some live performances throughout the day including the special launch of an ETS YouTube channel. If you cannot be there on June 4th the display will be available for you to enjoy until the end of the school year. MINI PONT-POP: Spanning the canyons between classroom desks, 70 student-designed bridges were put to the ultimate test at LaurenHill Academy in St. Laurent on May 17 at the Mini Pont-Pop competition. 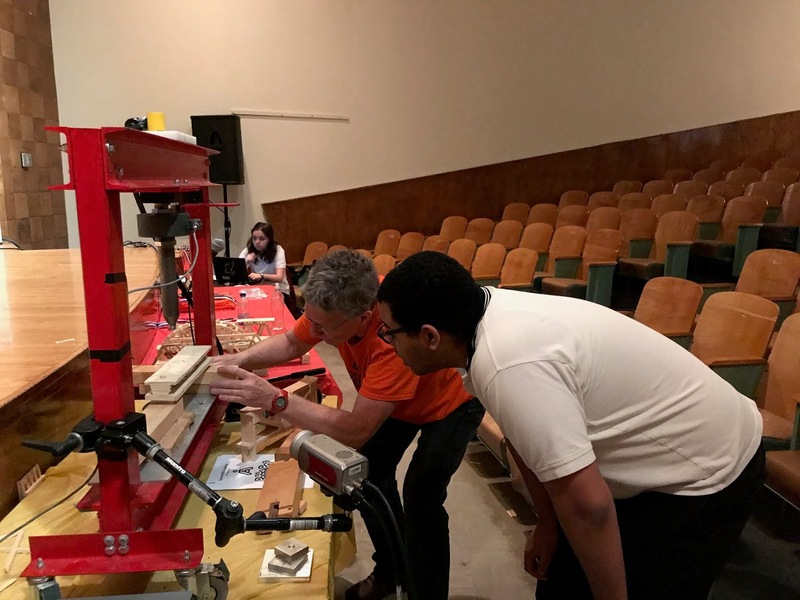 Based on the university level competition at the École de Technologie Supérieur (ÉTS), Grade 9 students, along with competition founder Richard Sicotte, studied the theory behind bridge construction in order to conceive and build a bridge that will attempt to withstand the forces from a hydraulic press. The competition was run for the first time at the EMSB and combined numerous STEAM (Science, Technology, Engineering, Arts and Mathematics) disciplines. Winning teams were awarded prizes and trophies for their designs. DIGITAL SOCIAL STORIES: A new virtual collection of digital social stories for students with autism will be launched at Parkdale Elementary School in Saint-Laurent (1475 Deguire Street) on Thursday, May 24 (6:45 pm to 8:00 pm). The EMSB has created a virtual collection of digital social stories that are freely available through the Parkdale Elementary School website (www.emsb.qc.ca/parkdale). Technology teacher Kristen Keyes will be on hand at the launch to train parents how to access and use the digital stories on their electronic devices. The digital social stories contain helpful strategies for students to use when frustrated by a variety of school-based events such as remaining calm on the school bus, behaving appropriately at recess, and asking for help. Specific situation are broken down and explained through animated visual graphics, and appropriate responses to deal with the difficult emotions are offered. Stories were expressly designed to be culturally diverse in order to reflect the Parkdale community. The digital stories project was made possible courtesy of a Professional Development and Innovation Grant from LEARN. The stories are designed to teach a variety of social skills to students with autism, and are based on the theory behind Social Stories™ as created by Carol Gray, a tool that schools often implement for students with autism. The project was initially developed by Marylène Perron, principal of Parkdale at the time of the creation of the project, Maureen Baron, Information and Communications Technology education consultant in the Educational and Technology Services department at the EMSB, and teachers at Parkdale who all worked with Mitchell Berljawsky, a Masters of Education Technology intern at Concordia University. Caroline Phaneuf, Joseph Lalla and Jeffrey. PARENTS CONFERENCE: The EMSB Parents Committee held a very successful conference on Saturday, May 5 at the Grande Prairies Vocational Centre in St. Léonard. Children and teens face a wide variety of issues and parents often struggle with how best to help their children. The free event, attended by close to 300 people, offered a series of workshops aimed at helping parents with some of the toughest parenting questions. Workshop topics included helping kids through anxiety and stress, dealing with bullying, getting through homework, cannabis and how to talk to your kids about the new laws, navigating the educational and healthcare system for those with special needs children and helping your child become an effective public speaker. Please see our detailed press release. Here is a report that was carried on CBC TV. DESIGNING THEIR OWN UNIFORMS: Students from the entrepreneur class at James Lyng High School in St. Henri are completing a four-month process in which they worked with artists to create new school uniform designs, screen-printed uniform samples, conducted a broad consultation in the school and received approval from the school’s governing bodies. 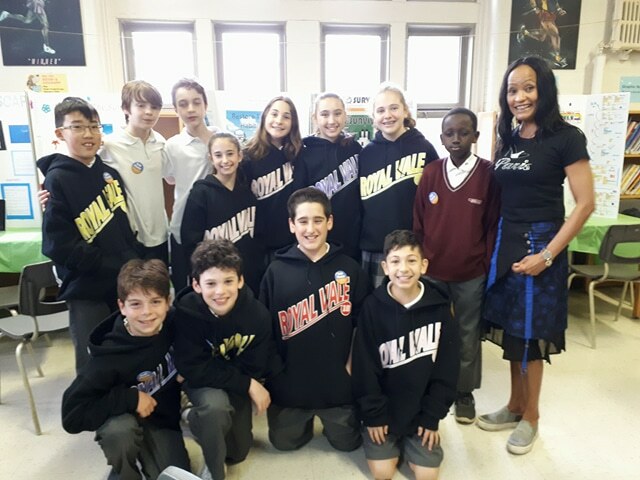 The students worked with local artists Sam Karimi, Jimmy Baptiste, Earth Crusher and Henley Germain to create uniform designs. With Kevin Nombrado from the Letterbet, a local screen-printing business, the students learned how to screen-print their uniform designs on shirts and sweatshirts. The class then created a survey to seek input from students and staff to gauge which uniforms received the most support. The feedback from both students and staff was very positive. The class then analyzed the data from the survey to create a proposal on a new uniform for the school’s staff council and governing board. Having received approval from the school’s governing bodies, the new uniforms will be adopted at the beginning of next school year. 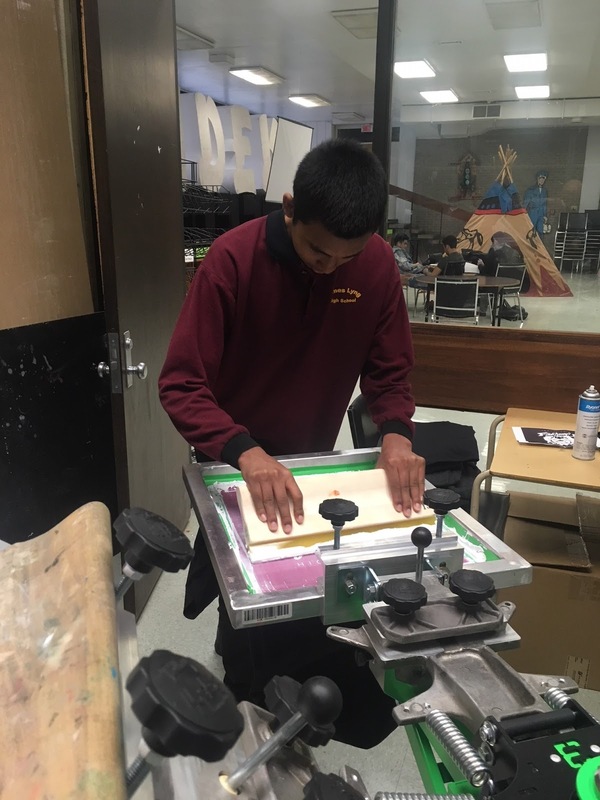 The entrepreneurship class will now screen print uniforms for the entire school to prepare for next September. “By giving students greater choice to express themselves, we can create a better school environment”, says James Lyng Student Sarha Garbowski, “The very fact that this design was created by James Lyng High School students and that the student body was consulted in its creation makes it a uniform that we can all feel proud of.” See this report on CBC TV. BIKE BLENDER: In 2017 Alison Manuel, one of James Lyng’s science teachers, seeing her students struggling to learn the Quebec Technology curriculum, went searching for innovative ideas to transmit the class’s concepts. In order to satisfy both the curriculum requirements and students’ interests, Ms. Manuel decided to set up a bike repair shop with and for her students. Through the schools Community Learning Center she received the support of multiple partners, such as the Eco-Quartier Sud-Ouest, Youth Fusion and McGill’s Education department. The cross curricular unit increased student engagement and learning, and therefore school perseverance. With its focus on sustainability, the unit also increased awareness of the environmental and social benefits of cycling, encouraging them to develop safe urban biking practices, and helping them to see themselves as social change agents at the local and international levels. The bike repair skills acquired can also increase chances of employability for the youth involved. As a way to give back to the local and international community, the bikes are donated to local organization Cyclo Nord-Sud, who, in turn, delivers these bikes to organizations in several African and Latin American countries to help support local social and economic initiatives. To take the project one step further, some students along with a team from Eco-Quartier built two bike-machines as prototypes for next year’s workshops. The newly built bike-generator will allow students to project documentaries outside or even charge their cell-phones, and the bike-blender will allow them to pedal to make smoothies with the school’s vegetable garden harvests. Through the Bike Repair Shop the school will be hiring seven students who will learn bike-repair and horticulture with the Eco-Quartier as part of a paid summer internship. COMMUNITY PAINT DAY: James Lyng has a $30,000 mural project (funded by the city) going up. They will be hosting a community paint day on May 29 at 2 pm where city representatives and community members will be coming in to contribute by painting in a designated area. The official inauguration of the mural will be on June 7 (7 pm). Enthusiastically taking part in the camp. LEADERSHIP: Approximately 230 students from across the EMSB wrapped up the 21st annual Student Leadership Camp at Camp Papillion, in Saint-Alphonse de Rodrigues under the theme of “The Four Elements: Together We Can Achieve More.” Secondary I through V students from James Lyng High School, John F. Kennedy High School, LaurenHill Academy, Laurier Macdonald High School, Lester B. Pearson High School, Marymount Academy International, Rosemount High School, Royal Vale High School, Royal West Academy, Vincent Massey Collegiate and Westmount High School came together for three days to form friendships and grow. This annual event is a unique exercise in leadership development. The student-centered leadership program sees a group of 32 organizing students and 28 animators working up to twice a week over a four-month period to develop and execute this crash course in team building, conflict resolution, communication, interpersonal skills, motivational skills, and the nuances of event planning. For the second time, organizers also prepared a workshop for the board’s administrators who gained first-hand insight into the power of leadership experientials for students. This year’s keynote speaker was Sweethearts and Heroes, who spoke to our students, administration, and staff advisors about the impact that bullying has on schools, neighborhoods, and individuals. Their message focused on the importance of creating climates of empathy, kindness, and leadership in all settings. Breaking with tradition, Organizer Adam Aktas from LBPHS delivered a student keynote on overcoming adversity, both speakers honed in on the importance of hope and being heroes for one-another. Year after year, these three days of leadership development outside of the brick and mortar of our schools engage and challenge our kids in ways that force them to evolve. These connections and lessons serve them well. Francois Lukawecki and his students in costume. 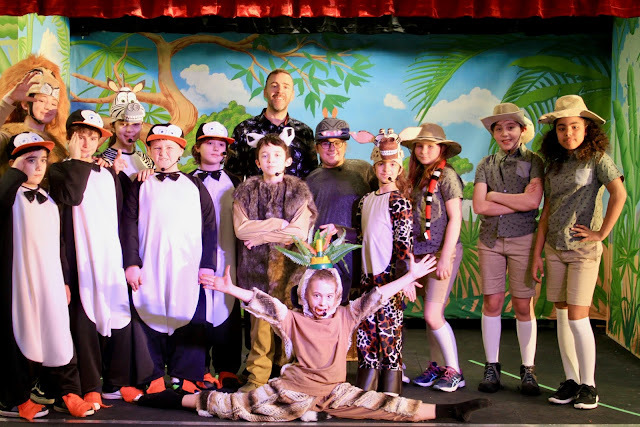 BANCROFT MUSICAL: Bancroft Elementary School's annual Musical this year was Madagascar! It was a spectacular show with over 160 students performing on stage. Children practiced their songs and dance moves for months and the final production was spectacular! Hats off to both Francois Lukawecki and Carla Batista whom directed the show once again this year. 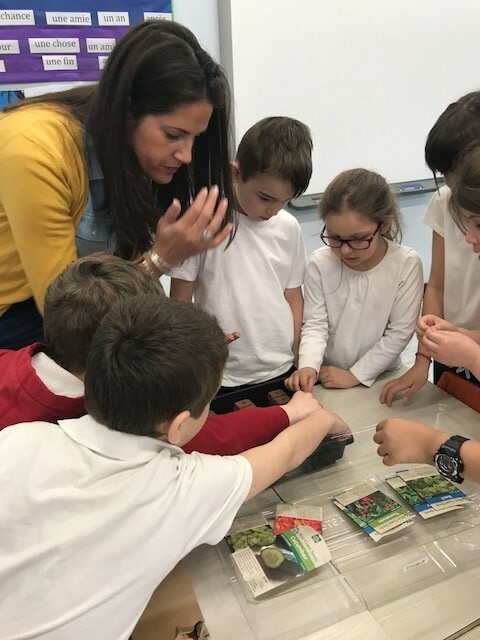 Meanwhile, the Grade 2 students in Cynthia Arzoumanian and Donna Friedman- Perlin's classes at Bancroft have been busy putting their knowledge about saving the earth into steam projects. Students were given a very open ended task to create something out of recycled material. For one day the students showcased their work to the entire school. Project examples were: a boom box made out of card board that could hold an iPhone, used lights with plastic water bottles to create Christmas lights, a pizza box that got transformed into art supply box on the go and many others. The Perspectives I team shows their products. 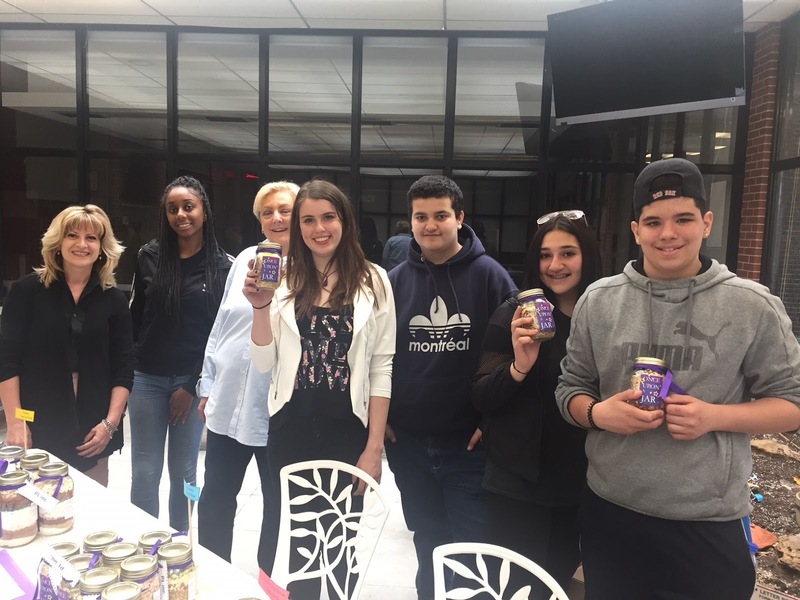 PERSPECTIVE ENTREPRENEURS: Perspective I Alternative High School's 2018 Entrepreneurship project, “Once Upon a Jar” successfully came to end with its last sale at the EMSB on May 9. Over 150 jars were sold at Parent/Teacher night, various cafes, Concordia University and at the EMSB Head Office. The students' fairy-tale theme captured its audience with delicious cookies, brownies and soups with all the ingredients in a beautifully-decorated jar. The focus this year was on advertisement and sales with attractive ads and a promotional video produced by our students. Proceeds were donated to the Montreal Children’s Hospital Foundation in honor of Ellie White. Ellie is the granddaughter of Head Teacher Barbara White. She has been battling leukemia this year. Perspectives I is looking forward to next year’s entrepreneurial adventure! VISIT FROM LONDON: Andrew Jacks, a writer from the Financial Times of London, England, paid a visit to FACE School downtown. He wanted to talk to some teachers about what it is like to teach in Quebec. Mr. Jacks was interested in the general approach that explains Canada’s strong performance, issues around integration of immigrants and First Nations, plus language and bilingualism. Taking part in the food drive. 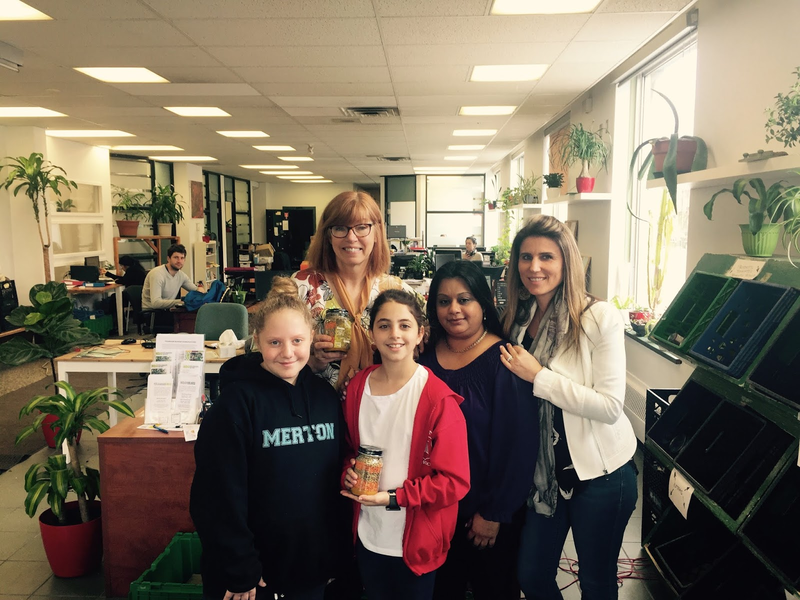 FOOD DEPOT: The Merton Home and School Association organized a "Recette en Pot" food drive benefiting the NDG Food Depot. In total, with the help of parents and the Merton School community, they collected 218 meals. On Friday May 4 students and staff members delivered the donation to Bonnie Soutar, Director of Development at the NDG Food Depot. CBC MIC DROP: MIC DROP, a new CBC podcast launched recently,lets teens take over the mic to share personal stories with each other, without adult interruptions. In each of the seven episodes, MIC DROP features mini-documentaries that invite teens into other teens’ lives. Conceived by Shari Okeke and Carrie Haber at CBC Montreal, this is the first CBC podcast to speak directly to teenagers and let them tell stories in their own voice. You’ll hear all the messiness and raw emotion of the teen years. Some stories are upbeat and positive while others tackle challenging and difficult topics. In each episode, teens show courage as they share their experiences and, at the same time, offer hope to others. The podcast will be a way for teens to connect with and support others in similar situations. The tone is sincere, surprising, supportive and spans an emotional range from playful to serious. The show’s voice is energetic, real, fun, fresh and courageous – unafraid to follow teens into new and unfamiliar places, or to struggle with them in the darkness. There will be seven weekly episodes at cbc.ca/micdrop. Follow on @cbcmicdrop. Taylor Cott works towards his medal. SKILLS OLYMPICS: Two students from the EMSB walked away winners at the recent the 15th Olympiades québécoises des métiers et des technologies (Skills Olympics) at the Place Bonaventure. The Olympiades is the largest event dedicated to vocational and technical training in Quebec. Inspired by the Olympic Games, the Olympiades offer the public an exceptional showcase of skilled trades and tangible models of success. 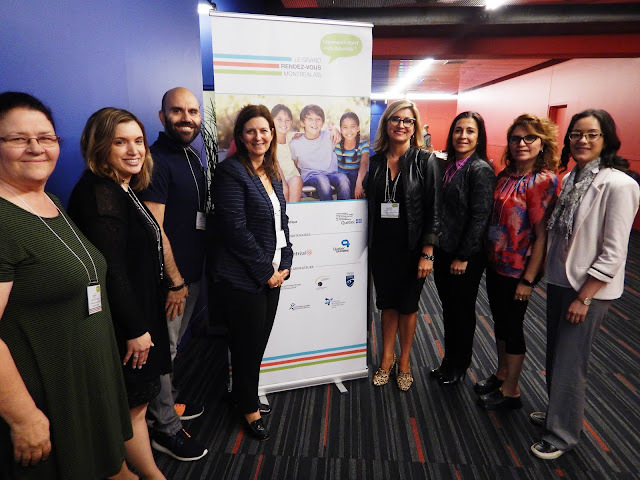 Over a period of two days, more than 300 finalists from all regions of Quebec demonstrated their expertise in 38 competing disciplines, under the watchful eye of thousands of visitors. The sectors that were represented were: food, metal fabrication, mechanics, computer technology, and construction. Place Bonaventure was transformed into a true multidisciplinary factory, with more than 150,000 square feet attesting to the quality and variety of programs offered at vocational training centres and CEGEPs throughout the province. Kevin Quieti from Laurier Macdonald Vocational Centre in St. Léonard won the Médaillon d’Excellence for Automobile Mechanics while Taylor Cott from Rosemount Technology Centre won the Bronze Medal in Cabinetmaking. He will also be competing at the national level at the Skills Canada competition, June 3 to 6 in Edmonton. The EMSB had two other students competing in Computer Graphics: Carlo Gabriel Marquez from Shadd Health and Business Centre in NDG and Dariush Ramezani from Rosemount Technology Centre. DEAL STUDENT RECEIVES BURSARY FROM SOFAD: Domenico Albanese is a soon-to-be graduate from Distance Education for All Learners (DEAL) at The High School of Montreal Adult Education Centre. This 22-year-old student has been visually impaired since birth. He first registered Please see the press release. with DEAL in October 2015, and with the support of the Connections Program at Innovation Youth, has found great academic success. Domenico was awarded a $1,000 bursary from SOFAD Distance Learning. He accepted this bursary, delivering a moving speech to hundreds of people at the AQIFGA Convention where he expressed his appreciation towards the SOFAD books and how DEAL gave him the opportunity to achieve his many accomplishments. Domenico completed his courses using PDF versions of SOFAD books, enabling him to download the books and use readers to hear his required reading. Eager to further his education, Domenico will attend Vanier College next year, with interests in Communications and Broadcasting, and Travel and Tourism. Congratulations, Domenico. Performers at the Smile Dinner Theatre. SMILE DINNER THEATRE EVENT RAISES $7,900: On April 20, over 230 friends, family, and special guests came out in support of Galileo’s Social Integration Students (SIS) and teachers at their first ever fundraising dinner theatre extravaganza at St. Pius Culinary Institute and Business Centre. The students’ 10 months of hard work rehearsing paid off! They showcased their different talents in dancing, singing, comedy, miming, and playing the Brazilian drums. From the sound of the applause, it was evident that the performances captivated the crowd. Galileo’s Socio-vocational Integration Services (SVIS) program was also showcased with the students’ handmade soap, candy bags, flower center pieces, and dessert platters created by the culinary students. In addition to the show, guests enjoyed a buffet dinner prepared by the Pius Culinary Institute students. Galileo’s mission is to cultivate the SIS and SVIS programs to promote independence and social integration by exploring their students’ personal, social, and school experiences in a stimulating environment. SMILE successfully met these goals! BBQ AND TALENT SHOW: On May 15, Galileo held its annual Barbeque and Talent Show . This event is to celebrate the 350 students’ love of learning and this represents their opportunity to share their unique talents with their peers and teachers. The Barbeque was a success but the talent show was a hit! Performances featured solo acapella, electric guitar players, choreographed dancing, original rap songs, whole class sing along, and a special presentation of tam tams by the SIS students. In the evening Pedro, a self-taught musician, played the violin, the flute, the accordion, and guitar while he sang and played each instrument at different intervals in between other acts. Social interaction is an important component of learning as it internalizes meaning through having engaged in an active event that students will always remember. DÉPARTS ET NOUVELLES DIRECTIONS D’ÉCOLE ET DE CENTRE: Deux directeurs, soit Michael Cristofaro (école secondaire Westmount) et Jacques Monfette (Centre d’éducation des adultes Wagar à Côte Saint-Luc), ont annoncé qu’ils prendront leur retraite le 1er juillet 2018. Ils seront remplacés respectivement par Robert DiMarco (présentement à l’école primaire Westmount Park) et Nicholas Katalifos (présentement à l’école primaire Roslyn à Westmount). Parmi les autres nominations au poste de directeur et directrice pour la prochaine année, mentionnons Marylene Perron à l’école Westmount Park (présentement directrice adjointe par intérim au Centre d’éducation des adultes John F. Kennedy à Saint-Michel) et Joana Genovezos à l’école secondaire Westmount (présentement directrice à l’école Coronation dans Côte-des-Neiges). PRIX D’EXCELLENCE: Félicitations à Anneliese Thelema Eckhardt-Moxie de l’école secondaire Rosemont, à Christopher Philbrick de l’Académie LaurenHill et à Tina Zhang de l’Académie Royal West, lauréats du Prix d’excellence 2018 décerné par le Cercle canadien des femmes de Montréal (CCFM). Cette distinction est accordée à des élèves méritants âgés de 14 à 17 ans qui démontrent des compétences en leadership, qui excellent sur les plans académique et social et qui s’impliquent activement tant à l’école qu’au sein de la communauté. 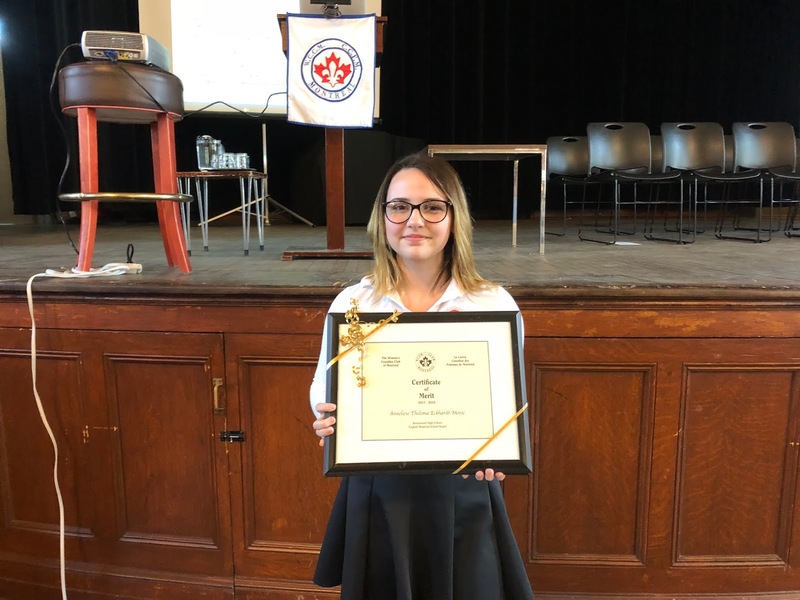 Nous tenons également à féliciter Addison Yasvinski de l’école secondaire Rosemont, gagnant du Prix d’excellence 2018 présenté par le CCFM à l’élève ayant remporté cette année le Concours d’art oratoire de la CSEM, dans la catégorie 3e secondaire. Le 1er mai, ces quatre élèves exceptionnels – accompagnés de membres de leur famille et de représentants scolaires – ont été officiellement récompensés à l’occasion de la rencontre printanière du CCFM et se sont mérités un séjour d’une semaine à Rencontres du Canada, le plus important forum des jeunes au Canada. 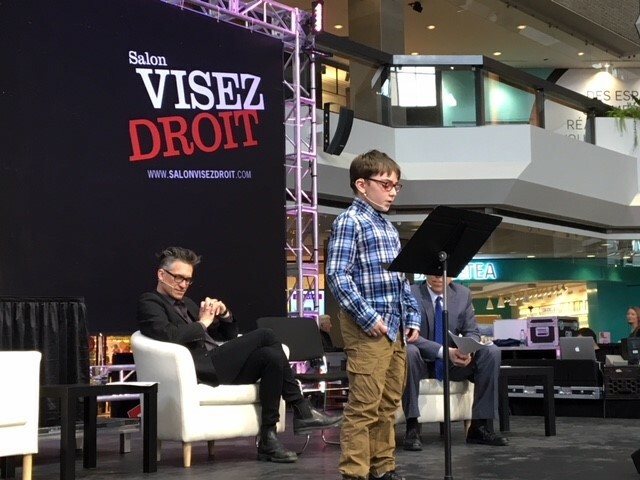 Les membres et les invités ont également eu le plaisir d’entendre Addison prononcer son discours gagnant. Au cours de l’année scolaire 2018-2019, ils passeront une semaine à Ottawa en compagnie de 140 autres élèves provenant d’un bout à l’autre du pays. Ils prendront part à des présentations, des sorties et des ateliers des plus intéressants qui les aideront à mieux connaître leur pays, à développer leurs compétences en leadership et à explorer d’éventuelles carrières. Ils pourront choisir parmi différentes semaines thématiques, notamment La science et la technologie, Les communications et les médias sociaux, La médecine et la santé, Le droit et notre système de justice, Les affaires et l’entrepreneuriat, La science et l’écologie, Les sports et la forme physique, Les affaires internationales et plus encore. Visitez le https://www.ewc-rdc.ca/pub/ pour en savoir davantage sur cette merveilleuse expérience unique. Deux anciens lauréats du Prix d’excellence ont également été félicités lors de la réunion. Il s’agit d’Ana Sofia Perez Battista et d’Eun-Taek Nathanael (Nate) Lee de l’école secondaire Westmount. Ana Sofia a commenté brièvement les expériences qu’elle a vécues cet hiver à Rencontres du Canada. PRIX DU PREMIER MINISTRE: Sabrina Jafralie, enseignante d’éthique et de culture religieuse à l’école secondaire Westmount, s’est récemment vu remettre un Certificat d’honneur dans le cadre du Prix du Premier ministre pour l’excellence en enseignement. Enseignante depuis 2001, Sabrina s’est toujours dévouée pour la collectivité en organisant une panoplie d’initiatives à l’école secondaire Westmount et dans la grande région de Montréal. Au nombre de ses réalisations, mentionnons la campagne « Soles to Soul » visant à recueillir à la grandeur de l’école des chaussures légèrement usées qui ont ensuite été distribuées partout dans le monde. 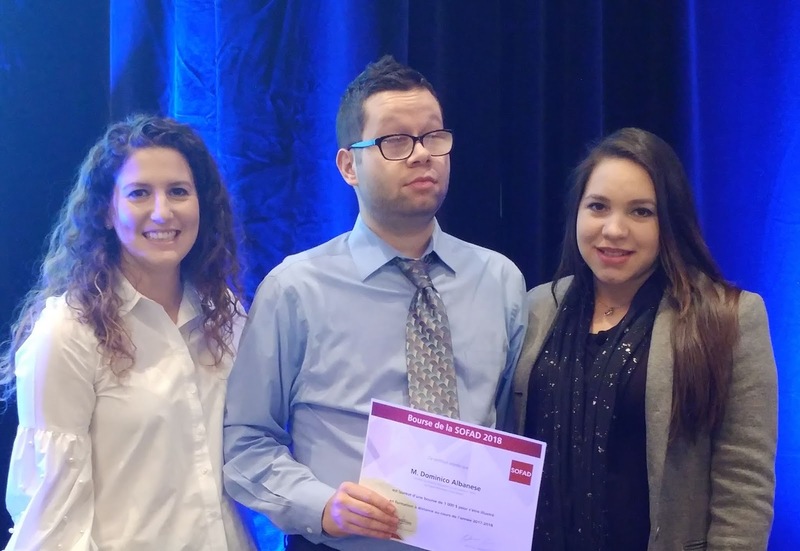 Fervente partisane et défenseure de l’apprentissage holistique, Sabrina a également reçu en 2014 le Community Leadership Award de la Fondation communauté Montréal à cœur, à la suite de sa mise en nomination par ses élèves. En plus d’enseigner, Sabrina travaille actuellement à la mise sur pied d’un organisme non gouvernemental en vue de promouvoir la littératie religieuse d’un bout à l’autre du Canada. Sabrina a obtenu une maîtrise en études théologiques de l’Université Concordia en 2010 ainsi qu’un doctorat de l’Université McGill en 2017. EN MÉMOIRE D’ERIC CROTTY: La CSEM souhaite offrir ses plus sincères condoléances à la famille d’Eric Crotty, ancien élève de l’école primaire Willingdon, qui est décédé récemment. Sa mère, Katherine Wilton, reporter au quotidien The Montreal Gazette, couvre fréquemment le dossier de l’éducation. Voici un extrait de l’avis de décès rédigé par ses parents : Le weekend dernier, par un dimanche après-midi pluvieux, Eric, notre fils adoré, a quitté la résidence familiale située à NDG pour se changer les idées mais n’y est jamais revenu. Il s’est enlevé la vie. Il souffrait d’un trouble d’anxiété sociale depuis trois ans. Il était âgé de 17 ans. Sa famille l’adorait; ses enseignants et camarades de classe appréciaient son bon caractère, sons sens de l’humour et son charmant sourire. Mais malgré tout, en raison de son trouble de santé mentale, il se sentait seul et isolé. Eric a grandi dans une merveilleuse communauté à NDG constituée de familles, d’amis et de voisins. Il a fréquenté l’école Willingdon où il excellait en mathématiques et en géographie. Il partageait la même obsession que Sheldon Cooper pour les drapeaux. Durant ses études secondaires au Collège de Montréal, Eric s’est développé une passion pour la course, a su maîtriser l’art de l’orientation et est devenu un tuteur en mathématiques accompli. En 4e secondaire, il a reçu un diagnostic de phobie sociale sévère qui l’empêchait de socialiser. Il a combattu opiniâtrement sa maladie et a accepté toutes formes d’aide et de traitement à sa disposition. Avec l’appui de ses enseignants et de ses camarades de classe, il a obtenu son diplôme le printemps dernier et poursuivait maintenant ses études au Collège Marianopolis dans l’espoir d’y entamer un chapitre plus heureux de sa vie. Il s’était joint à l’équipe de génies en herbe Reach for the Top et a aidé son équipe à se tailler une place aux Championnats canadiens qui se tiendront ce mois-ci. Les cours de sciences et de musique l’enthousiasmaient et il songeait à étudier la chimie à l’université. Il était membre du Club d’orientation Ramblers de Montréal et pratiquait le sport irlandais hurling dans la formation des Shamrocks de Montréal. Il avait des projets d’avenir et était impatient de pouvoir voter pour la première fois à l’automne, lors de l’élection provinciale. La plupart du temps, Eric était un jeune homme heureux, toujours souriant avec un grand sens de l’humour. Il avait fait des progrès pour surmonter sa phobie sociale, mais la solitude et l’isolement qu’il éprouvait périodiquement sont devenus trop lourds à supporter. Ce merveilleux jeune homme manquera terriblement à ses parents, Niall Crotty et Katherine Wilton, de même qu’à sa sœur Sarah. PRIX HUMANITAIRE/ENVIRONNEMENTAL: L’association foyer-école de Willingdon est immensément fière d’annoncer que son école s’est méritée le Prix humanitaire/environnemental Pat Lewis (FQAFÉ). Cette distinction vise à honorer les élèves du primaire et du secondaire pour leurs efforts exceptionnels à l’égard d’une cause humanitaire ou environnementale. Ce prix a été décerné à l’ensemble des élèves de Willingdon, du personnel et des parents de l’association foyer-école en reconnaissance de leurs efforts collectifs déployés pour promouvoir une prise de conscience quant aux enjeux liés à l’eau par l’entremise du défi-eau de l’école et de la marche WE Walk for Water; pour appuyer le programme de recyclage et sensibiliser les gens au compostage et à la réduction des déchets lors d’activités organisées par l’association foyer-école; pour soutenir la banque alimentaire de NDG grâce à nos collectes de denrées du temps des Fêtes et à la nouvelle initiative Thoughtful Thursday; pour soutenir notre enfant adoptif en Équateur et pour avoir introduit à l’école le programme « Unité sans violence ». JOURNÉE NATIONALE DES ENSEIGNANTS: Dans le cadre de la Journée nationale des enseignantes et enseignants, la CSEM a honoré trois enseignants à qui elle a décerné des prix sous forme de cartes-cadeaux chez P.F. Chang’s et La Cage Brasserie sportive. La cérémonie a eu lieu à l’Académie John Caboto à Ahuntsic et était coparrainée par Breakfast Television de City. La CSEM a reçu une foule de mises en candidature dans les trois catégories suivantes : secteur des jeunes, secteur de l’éducation des adultes ainsi qu’éducation physique et de la santé. Jose Lourenco, directeur de l’accueil chez P.F. Chang’s à Montréal, a remis des cartes-cadeaux d’une valeur de 100 $ aux enseignants Shaun Simon de John Caboto, Lucille Ducol de Général Vanier à Saint-Léonard et Jelena Molter du Centre de carrières St. Pius à Ahuntsic. Catherine Verdon Diamond et Elias Makos de Breakfast TV ont agi à titre de maîtres de cérémonie. Pour visionner le reportage de Breakfast TV. INITIATIVE POUR CONTRER L’INTIMIDATION: Un programme de lutte contre l’intimidation mis sur pied à l’école primaire St. Gabriel dans Pointe Saint-Charles a pour but de donner aux élèves, aux enseignants et au personnel l’occasion de discuter de l’impact des comportements d’intimidation, des mesures qui peuvent être prises pour faire face à l’intimidation et la prévenir, ainsi que de la façon de créer une culture positive et sécuritaire à l’école. Les élèves ont pris part à diverses activités, notamment un projet de courtepointe à la grandeur de l’école où ils créent des slogans sur la lutte à l’intimidation et la bonté, participent à des discussions en classe et prennent part à un projet artistique (entrelacer des mots positifs sur la clôture de l’école). Pour souligner le dernier jour de cette initiative, le 16 mai, les élèves et le personnel ont porté du rose et se sont engagés à se mobiliser contre l’intimidation. GRAND MÉNAGE À L’ÉCOLE EDWARD MURPHY: Dans le cadre du Projet vert à l’école primaire Edward Murphy dans Hochelaga-Maisonneuve, les élèves et le personnel ont uni leurs efforts afin de nettoyer le terrain de l’école et les espaces verts avoisinants. Cette journée s’inscrivait dans le cadre du programme de la Ville de Montréal « Ensemble pour la propreté » et de la Journée Montréal Ensemble où chaque geste de gentillesse contribue à faire une différence. En compagnie de l’animateur de vie spirituelle et d’engagement communautaire Rocco Speranza, les élèves et le personnel ont passé la matinée à se familiariser avec les 4R, soit Réduire, Réutiliser, Recycler et Respecter. Ils ont appris à quel point il est essentiel de se montrer respectueux envers notre planète, notre environnement, nos classes, nos communautés et les animaux. CONCOURS DE CRÉATION DE LOGOS POUR LA SENSIBILISATION À L’AUTISME: Cinquante-huit élèves de l’école Edward Murphy ont participé à un concours de création de logos pour favoriser la sensibilisation à l’autisme. L’objectif visait à amener les élèves à réfléchir sur l’autisme et à exprimer, dans leurs propres mots et avec des dessins, ce que ce trouble représente pour eux. Les logos ont été affichés au mur et examinés, le 10 mai, par les juges suivants : Krista Leitham de Marchons Montréal pour Autism Speaks Canada; Wendy Singer, directrice de la rédaction de la publication Inspirations et coordonnatrice des activités; ainsi que Dolores De Michele, secrétaire de l’école. Les juges ont été éblouies et touchées par la sensibilité et la beauté de chacun des logos. Le logo gagnant arborant la lettre « A » dans un style rappelant les superhéros est l’œuvre de William Campbell, élève de 5e année. Il a été choisi pour son message empreint de force et d’encouragement, ainsi que pour sa reproductibilité. William a remporté un dîner-pizza pour toute sa classe! Le deuxième prix est allé à Daniella Alessi, élève de 2e année, pour son message sincère d’entraide et d’amitié, illustré par son logo. Jacob Caligiuri, élève de 1re année, a quant à lui remporté le troisième prix pour son logo débordant d’amour et d’amitié, synonyme de Fun 15 with Friends. Il ne comportait aucun texte, ce qui représente bien bon nombre d’autistes qui sont incapables de s’exprimer verbalement. AUTISM SPEAKS CANADA ─ MARCHONS MONTRÉAL LE 27 MAI 2018: Commencez votre dimanche du bon pied en vous joignant à l’équipe Inspirations de la CSEM lors de cette marche ayant pour but d’amasser des fonds et de mieux faire connaître l’autisme. Cette année, l’équipe Inspirations de la CSEM est coprésidée par Alana Goodings et Cynthia Fugnitto, toutes deux enseignantes à l’école primaire Edward Murphy. Pour vous inscrire, visitez le www.ascwalk.ca et recherchez Team Inspirations EMSB. Les fonds recueillis lors de la marche permettent d’appuyer l’accès aux ressources, la programmation inclusive, les services destinés aux jeunes adultes, les subventions communautaires et la recherche de calibre mondial. Pour en savoir davantage, veuillez communiquer avec Alana à agoodings@emsb.qc.ca ou à kristaleitham@autismspeakscan.ca. SEMAINE ÉDUCATION MÉDIAS: HabiloMédias, le centre canadien d’éducation aux médias et de littératie numérique, et la Fédération canadienne des enseignantes et des enseignants (FCE) sont heureux d’annoncer que la Semaine éducation médias de cette année aura pour but d’aider les élèves à distinguer le vrai du faux en ligne. La Semaine éducation aux médias, qui se déroulera du 5 au 9 novembre, aura pour thème « Fait ou faux : Aidez le monde à mettre un terme aux fausses informations » afin de souligner l’importance de vérifier que les renseignements en ligne sont véridiques, objectifs et pertinents. La Semaine éducation médias, un événement annuel coanimé par HabiloMédias et la FCE depuis 2006, souligne l’importance d’enseigner aux enfants et aux jeunes des compétences en littératie numérique et médiatique. Pour obtenir des mises à jour, visitez medialiteracyweek.ca ou inscrivez-vous à l’infolettre. OLYMPIADES DES MÉTIERS ET DES TECHNOLOGIES: Deux élèves de la CSEM ont remporté les honneurs lors de la 15e édition des Olympiades québécoises des métiers et des technologies (Skills Olympics) à la Place Bonaventure. Ces Olympiades représentent le plus grand événement dédié à la formation professionnelle et technique au Québec. Sur le modèle des Jeux olympiques, les Olympiades offrent au public un spectacle exceptionnel mettant en vedette des métiers qualifiés et des modèles de réussite tangibles. Durant deux jours, plus de 300 finalistes provenant de toutes les régions du Québec ont mesuré leur expertise dans 38 disciplines, sous l’œil attentif de milliers de visiteurs. Les secteurs suivants étaient représentés : alimentation, fabrication du métal, mécanique, technologie informatique et construction. Pour l’occasion, la Place Bonaventure s’est transformée en une véritable usine multidisciplinaire. Dans l’enceinte de ses 150 000 pieds carrés, les visiteurs ont été à même de constater la qualité et la variété des programmes offerts dans les centres de formation professionnelle et les cégeps au Québec. 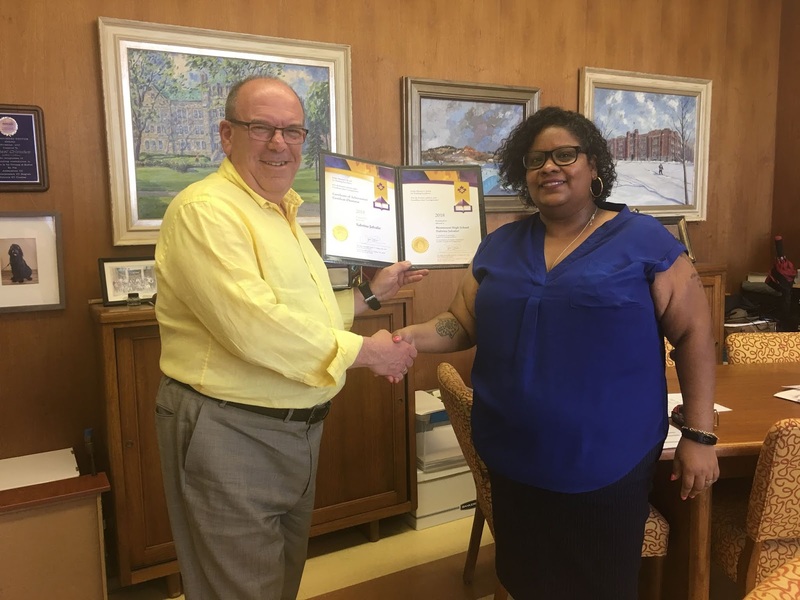 Kevin Quieti du Centre de formation professionnelle Laurier Macdonald à Saint-Léonard a remporté le Médaillon d’Excellence dans la catégorie Mécanique automobile, tandis que Taylor Cott du Centre de technologie Rosemont s’est mérité la médaille de bronze en Ébénisterie. Il participera également aux Olympiades canadiennes des métiers et des technologies lors de la compétition nationale, du 3 au 6 juin à Edmonton. Deux autres élèves de la CSEM prenaient part aux Olympiades dans la catégorie Infographie. Il s’agit de Carlo Gabriel Marquez du Centre de santé et d’études commerciales Shadd à NDG et de Dariush Ramezani du Centre de technologie Rosemont. BOURSE DÉCERNÉE PAR SOFAD À DOMENICO ALBANESE DU PROGRAMME DEAL: Domenico Albanese sera prochainement diplômé du programme d’éducation à distance DEAL au Centre d’éducation des adultes The High School of Montreal. Âgé de 22 ans, Domenico est malvoyant depuis sa naissance. Il s’est inscrit au programme DEAL en octobre 2015 et avec le soutien de Connections Program d’Innovation Youth, il a connu beaucoup de succès. Il a obtenu une bourse de 1 000 $ de SOFAD Distance Learning. Au moment de recevoir sa bourse, il a prononcé un discours émouvant aux centaines de participants présents à la convention AQIFGA où il a exprimé sa reconnaissance pour les livres SOFAD et a expliqué comment DEAL lui a permis d’atteindre plusieurs buts. Grâce aux livres SOFAD en version PDF qu’il a pu télécharger et aux services de lecteurs pour les lectures qu’il devait faire, Domenico a réussi ses cours. Désireux de poursuivre ses études, il fréquentera le Collège Vanier l’an prochain. Il s’intéresse aux communications, à la télédiffusion, aux voyages ainsi qu’au tourisme. Toutes nos félicitations à Domenico! The next Focus will be published on June 14. Submissions should be made to Michael J. Cohen preferably by e-mail (mcohen@emsb.qc.ca) by June 8 at Noon.
" DELAY OF ELECTIONS: The EMSB Council of Commissioners has adopted a resolution by majority, calling upon the Minister of Education not to postpone school board elections scheduled for this November." A very nice, descriptive and informative post, thank you for sharing.